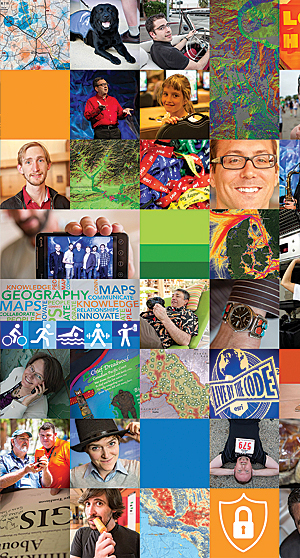 From May to October, several thousand GIS users across the globe will be converging on Cape Town, São Paulo, Split, and Kuwait City—disparate points of the compass that share one huge distinction—all are venues for Esri’s 2014 regional user conferences. It doesn’t matter if you’re a novice GIS user or an experienced developer or analyst; attending a regional user conference will offer you opportunities to learn the latest technology from the best minds in the field, share your success stories with regional peers, and network with colleagues and exhibitors. You’ll return home energized, inspired, and armed with new confidence, tools, and techniques that will help your organization maximize its leverage of GIS applications in pursuit of its goals. “This will be the first gathering of all Esri users in Africa along with leading Esri experts,” says Esri South Africa marketing executive and organizing team member Lauren Sweidan. About 700 attendees are expected from key countries, including South Africa, Rwanda, Kenya, Ghana, Namibia, and Angola. Conference organizers anticipate that some sessions will be conducted in French. “For the first time, users from diverse countries in Africa will be able to network,” Sweidan says. Imagem Geosistemas e Comércio Ltda., Esri’s official distributor in Brazil and the host, is expecting attendees from all over Latin America. In addition to Brazil, Colombia, Chile, Peru, Mexico, and Argentina will be well represented, says Imagem spokesperson Izabel Cristina Costa. As the host city, São Paulo has major credentials, having become Brazil’s economic powerhouse with an increasingly vibrant nightlife, food, and fashion scene. The 2014 World Cup to be held in June and the 2016 Olympics in Rio on the horizon will only heighten Brazil’s appeal. Notables scheduled to speak include Eneas Brum, Imagem’s CEO; Leandro Rodriguez, manager, Esri in Latin America; Ismael Chivite, Esri ArcGIS for Server product manager; and Deilson Silva, Esri ArcGIS platform technical evangelist. Paper sessions, technical workshops, Lightning Talks, and user stories will give attendees many opportunities to share their work. The conference’s main thrust will be on understanding the value of good applications focused on business challenges, she says. “The hope is to blend this passion for learning about GIS technology advancements with ‘a joy of life’ and a wonderful Mediterranean setting for a remarkable conference,” says Boran Loncaric, CEO of Esri official distributor GDi GISDATA LLC—the EUC host. Loncaric encourages registrants to submit their abstracts. “Come and show others the best way forward in using GIS technology and demonstrate your successes to all of Europe and the Mediterranean,” he says. Two evening parties will show off traditional Croatian hospitality, Loncaric says. One will be a real Mediterranean-style party on the beach of the Hotel Le Méridien Lav, with lots of festive music, fish, and Mediterranean food to help celebrate GDi’s 25th anniversary. On the evening of the second conference day, guests will go into the historic city of Split itself to see almost 2,000 years of history and wonderful romantic settings. The main official social event will be held at the Croatian National Theater in Split, where a rich cultural program and dinner will take place. OpenWare Information Systems Consulting Company, Esri’s official distributor in Kuwait, will host the 2014 Esri Middle East and Africa User Conference (MEAUC), to be held October 20–22, in Kuwait City. Governments will show GIS applications in action for workers and decision makers, as well as the general public, with industry tracks and user group meetings for the region’s wide spectrum of industry users. “Please make sure you submit your abstract before the deadline [check the MEAUC website for updates] to get a chance to place your work and experience under the spotlight,” Arab says.